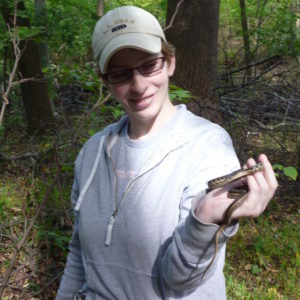 We are excited that Dr. Caitlin M. Fisher-Reid, a member of the genetics project team, was recently awarded a $8,000 grant to develop microsatellite markers for the salamander populations in our network. Caitlin authored the Faculty and Librarian Research Grant that was awarded through Bridgewater State University’s Center for the Advancement of Research and Scholarship. Dr. Bill Peterman and Dr. Alexa Warwick are also members of the genetic project team. The project begins this spring field season. Dr. M. Caitlin Fisher-Reid from Bridgewater State University in Massachusetts. Copyright © 2019 Salamander Population and Adaptation Research Collaboration Network. Powered by WordPress. Theme: Spacious by ThemeGrill.